I wake early on Saturday, filled with excitement as always about the day to come. I leave Maria sleeping soundly and go for an early morning walk around the town. A thick bank of mist covers the town and lake, I’m guided only by the songs of the birds – they go off like mini car alarms as I stroll past in the fog. Dozens of swallows, recently returned from Africa, dive-bomb around me before returning to their nests in the medieval walls. Sparrows hide amongst the spring blossom, skylarks and blackbirds sing to their heart’s content. 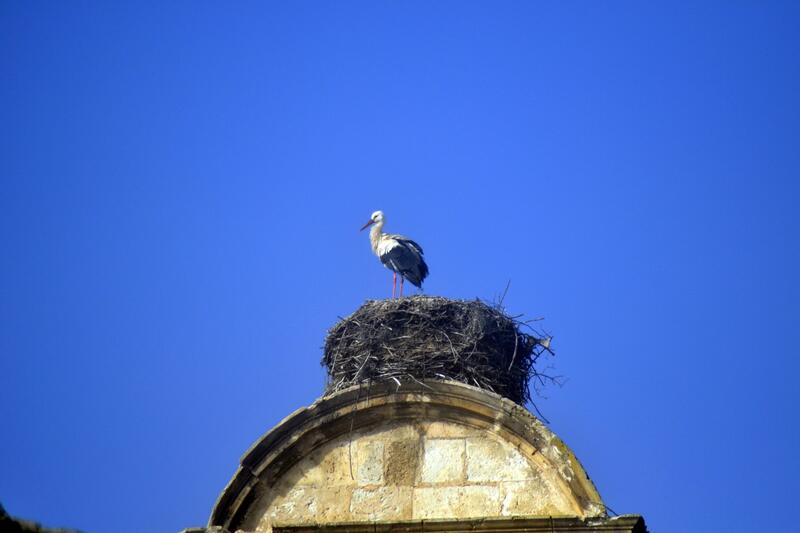 Giant white stork, nesting on top of the old church, set off on their morning hunt for food. I’m joined by a scruffy dog, happy for some company on this lonely morning. 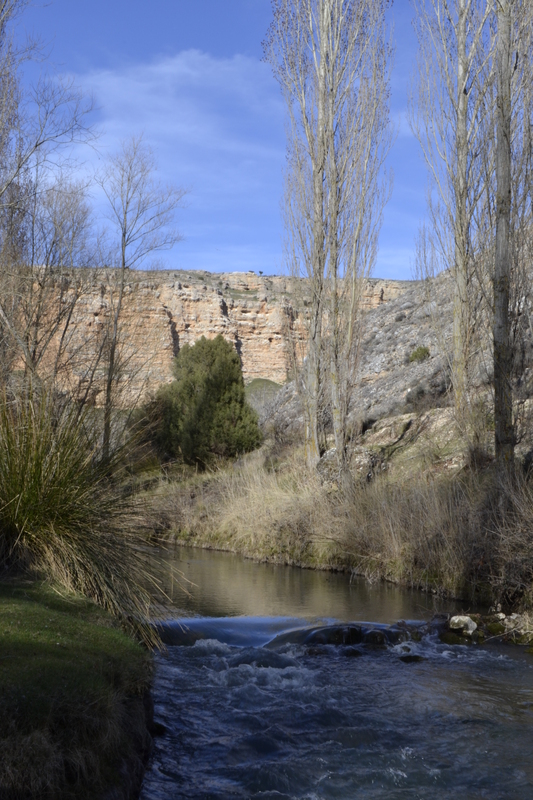 We’re told by Christoph, the owner of the hotel, of a walk that takes you above the nests of the vultures and down into the mouth of the canyon of the Rio Riaza. The sun has broken through the mist and it looks like it’s going to be a beautiful hot, sunny day. I’m glad to be wearing shorts for the first time this year after a relatively long, cold Spanish winter. We leave the car by the side of the road and set off towards the canyon. 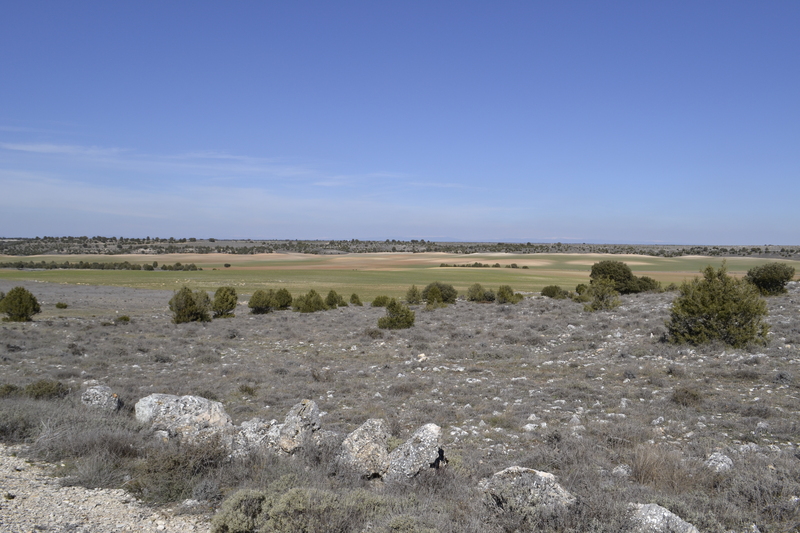 The cultivated fields look like a watercolour painting; rolling waves of green and brown. As we near the canyon the mountains, covered in snow, rise high far in the distance above the shimmering turquoise lake. We are alone, the only sound is the call of birds and the rush of wind. The vultures seem to come out of nowhere, forewarning us with their enormous shadows that temporarily block out the sun like small clouds. A lone duck beats its wings on the cold, still water of the lake. We walk on for an hour, snaking our way down to the lake shore and a large dam. Here the concentration of birds is astonishing. 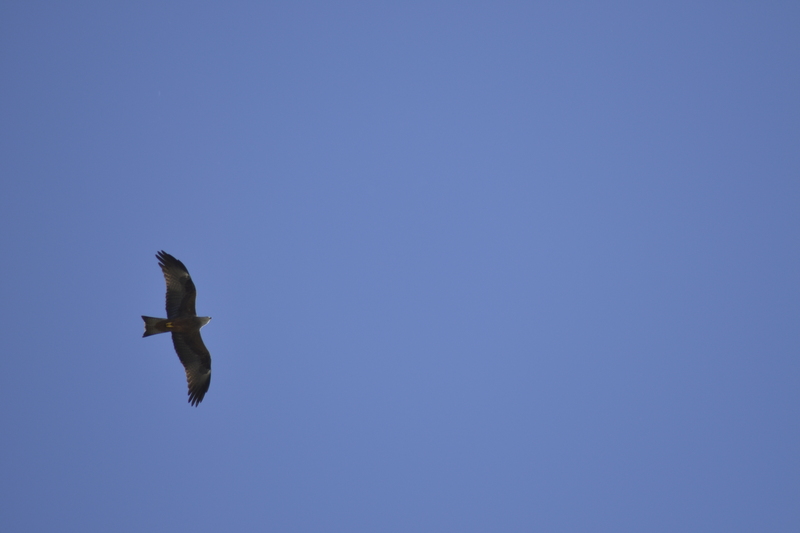 It is a haven of bird-life – falcons, hawks, eagles, crows, kites and vultures all seem to fight for our attention. We see an enormous, majestic Golden Eagle cross the lake and perch on a telegraph pole on the shore opposite us. We watch in awe. 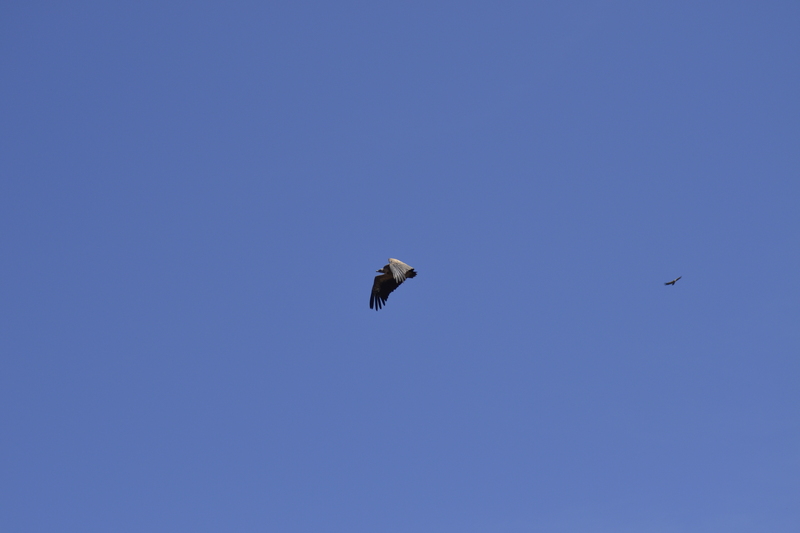 Yet even this bird is dwarfed by the Griffon Vultures. It’s a slightly disconcerting feeling, wandering along enjoying the fresh air and the views, and you look over your shoulder and you see five vultures circling above you. Thankfully I’m with Maria who presents a much more manageable, and tasty, meal for these scavengers. 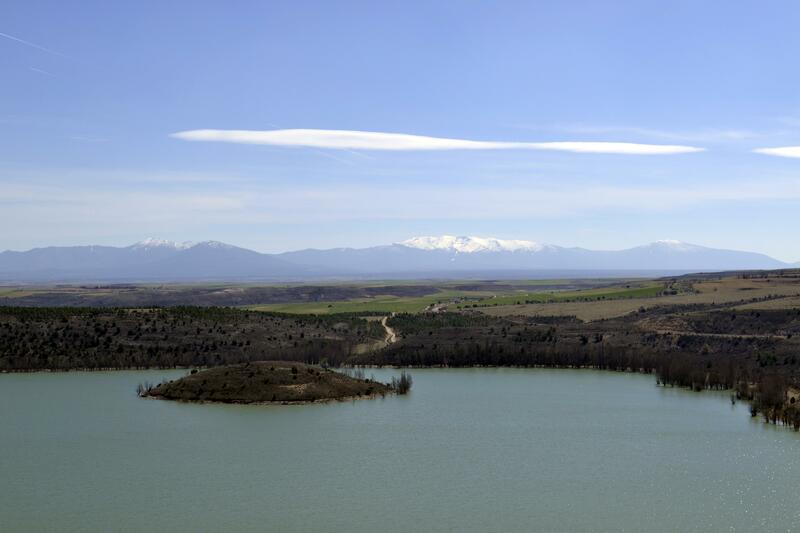 We picnic above the lake, looking out onto the mountains in the distance, we are joined by curious lizards soaking in the sun on warm rocks as falcons glide over the lake with sumptuous ease. A vulture flies not more than five metres above our heads, its giant wings make a loud ‘whooshing’ noise as it passes. Maria’s survival instinct kicks in and she hides behind a rock, waiting for the danger to pass. After lunch we head to a pretty little village that marks the entrance to the other side of the canyon. The contrast couldn’t be more stark – beautiful, cultivated farmland is lined by vertiginous cliffs filled with nesting vultures. We cross the River Rianza, a slice of England in this surreal landscape as reed warblers play and sing in the reed beds and trout hide in the shadows. This river is home to water voles and otters, a sign of the health of the river – yet sadly we see none. 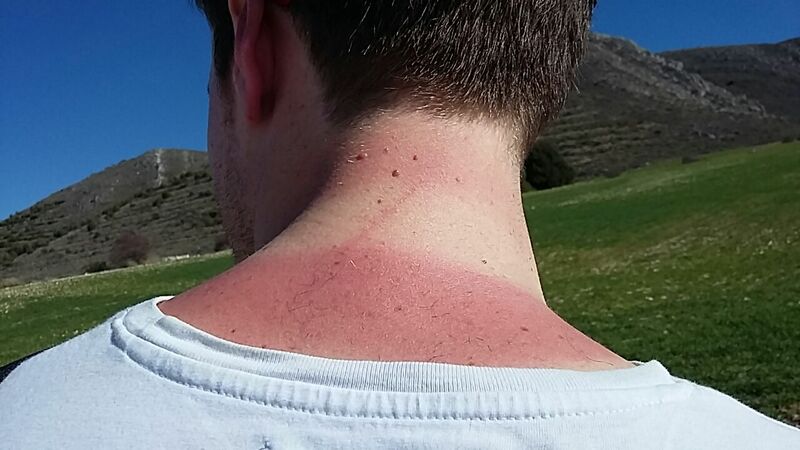 We’ve been walking in the unbroken sunshine all day and it’s taken its toll on my soft, northern European skin. 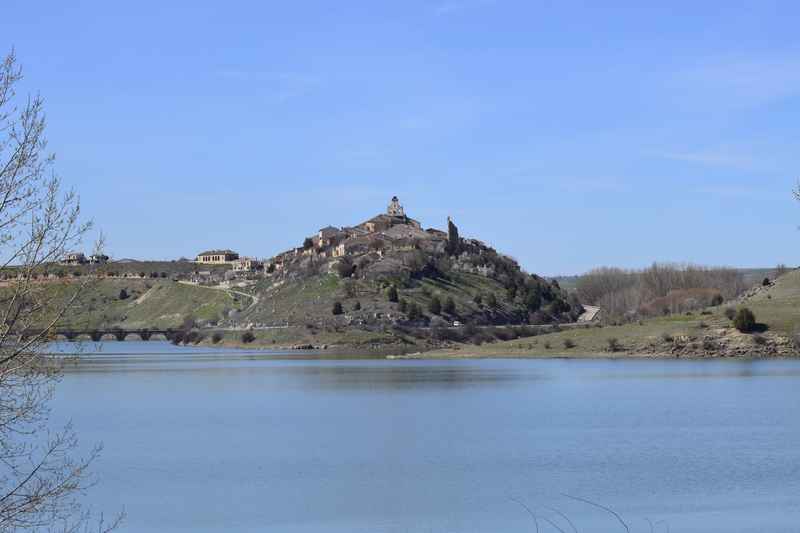 A long drive back to Madrid awaits us so we say goodbye to this magical place, a true conservation success story, have a well-deserved cold beer and make our way home where nesting vultures are replaced with nesting hipsters. Yes it’s a very special place. Highly recommend visiting it, you almost forget you’re still in Europe!